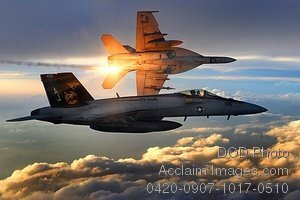 Description: Free, public domain image: Beautiful Shot of Two Navy Super Hornets Flying Combat Patrol at Sunrise. Two U.S. Navy F/A-18 Super Hornets from Strike Fighter Squadron 31 fly a combat patrol over Afghanistan on Dec. 15, 2008. DoD photo by Staff Sgt. Aaron Allmon, U.S. Air Force..